James Grayson says Saints are a club on the up after securing their first trophy under boss Chris Boyd on Sunday afternoon. Grayson was named man of the match after steering his side to a 23-9 Premiership Rugby Cup final win against Saracens at a sold-out Franklin's Gardens. 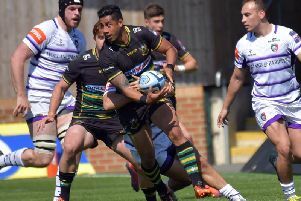 The Academy graduate delivered some key passes as Saints scored three tries on their way to claiming their first piece of silverware since winning the Premiership in 2014. And fly-half Grayson, who picked up the award for Premiership Rugby Cup breakthrough player of the season after the game, said: "I'm very proud. "It's a bit of history here for myself, having grown up here. "The boys are excellent and so are the fans so I'm really happy. "I'm really enjoying my rugby. "Boydy's given us confidence and everyone's enjoying it. "Everyone's playing, having fun and the fans are enjoying it. "It's testament to Boydy, Sam (Vesty), all the guys who have come in. "The club's going in the right direction."